That’s right guys. Leading mobile operators in Malaysia which includes Celcom, Maxis and Digi has started posting on their official websites regarding the availability of the iPhone 6 and iPhone 6 Plus from Apple in Malaysia. 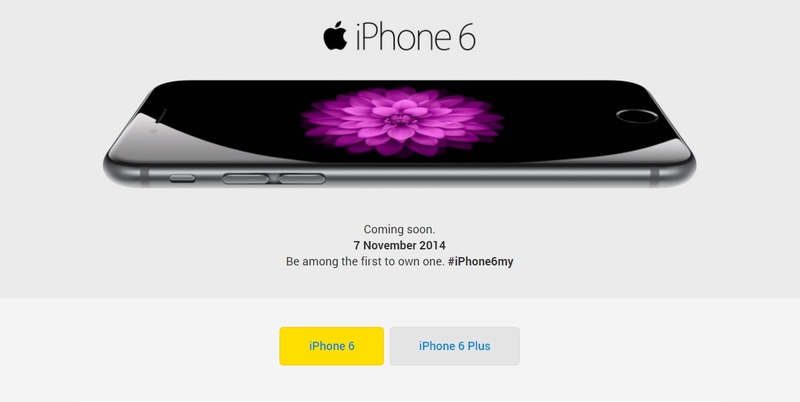 The most obvious one is from Digi as they state clearly ” Coming Soon 7th November 2014 ” rather than Celcom which stated as ” Coming Soon ” only while Maxis started to pre – register the latest iPhone gens. This simply means that we Malaysians would have not to wait too long for the iPhones to arrive in Malaysia where some rumors claimed that it could take up late November and even December. I guess this is the most exciting news for existing iPhone users who might look at a great upgrade to the better and later version of iPhone. I personally love the iPhone 6 Plus simply because of the gorgeous design and sizing itself. The specifications are not bad at all but as usual the one any only problem would be the pricing itself. It is definitely going to be the most expensive iPhone made yet, so for those who are intending to get the iPhone 6 Plus, do save up a little bit more than how much you used to save up for the regular iPhone. With iOS 8.1 being the latest version, most of the noticeable bugs have been fixed and now is as stable as a rock claims Apple. So how excited are you on getting the iPhone 6 and iPhone 6 Plus? Are you intending to renew your existing contract with your mobile operator provider, or rather get the phone off contract? I am pretty sure getting it off contract could be a little tougher as most of the mobile operator providers would be prioritizing on bundled deal for sure. Update: Maxis All Malaysian Telcos confirm to launch the iPhone 6 and iPhone 6 Plus one day earlier, 6th of November 2014. Next ArticleNew Moto G 2014 is now in Malaysia. Priced at RM688.